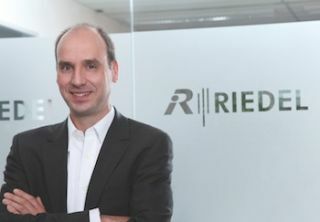 Riedel Communications, provider of pioneering real-time video, audio, data, and communications networks, today announced that Thomas Riedel, the company's CEO, and Henning Kaltheuner, head of product management, will present at the 2013 NAB Show. Riedel's presentation, "Red Bull Stratos - Remote Production at the Edge of Space," will look at the record-breaking skydive by daredevil Felix Baumgartner and how it was televised. In this case study, Riedel will provide a comprehensive overview of the complete production and the technology that helped to bring Baumgartner's supersonic skydive live to an international audience. The session is scheduled for April 9 at 1:30 p.m., in room S227 of the South Upper Hall. At noon on April 11, Kaltheuner will present "IEEE 802.1 AVB Ethernet Protocols and Their Applicability to Broadcast Systems." He will describe the technology of the latest IEEE standards for audio video bridging (AVB) and their potential for signal transport in broadcast infrastructures.